If you ask the average person what kind of house they would prefer, they likely could tell you the style of the house, describing it in detail, and give you every one of the house's features. Some who have some drawing skill could even sketch the house for you. It takes a lot more than a sense of style to build a house, though. In fact you have to be licensed in every state just to take on this task. Here are some things that contractors have to learn before they are allowed to build homes or master the contractor license renewal process. Imagine how dangerous some houses would be for living if there were no agency to inspect the work. People would have to deal with fire hazards, substandard materials, fall and accident hazards, and other potential dangers. Fortunately, cities have processes in place to ensure that all contractors understand how to read the blueprints for buildings and understand how legal codes might impact the building plans. No matter how beautiful the idea is for a new house, it has to stand up to current code regulations. Every gorgeous idea is not necessarily the most energy efficient use of materials and space. When contractors participate in continuing education courses, or take the required courses for initial licensure, they learn how to best use materials in order to protect the environment, preserve the longevity of materials, and conserve energy. Although some cities offer incentives to encourage contractors to engage in these best practices, the most trusted contractors are already using energy efficient plans as a part of their routine contract work. Almost everybody knows someone who is a jack-of-all-trades and could build a house from the ground up with little to no help. However, this natural ability does not mean that the jack-of-all-trades is prepared to build safely. Licensing courses teach contractors the best ways to approach safety and keep construction sites compliant with local and national regulations. The risk of not having this training is personal and crew safety, as well as a potential construction shut-down if officials are not pleased with safety precautions. No matter how good your idea may be for a new house, it is not sound unless it can withstand the inspections required by most cities. 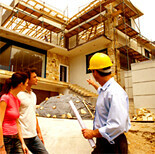 The rules are there to protect both contractors and those who dwell in the house. Licensing courses help ensure contractors really know what they are doing.